We’d like to start off by telling everyone Happy New Year! I hope this year brings you and your family many Blessings and much happiness. Let’s discuss various types of potential loads and how to properly size your generator for them. Lagging power factor, where current lags voltage, is normally the case. Power factor is the ratio of kW to kVA and is typically .8 or 80% lagging power factor for 3-phase systems and 1.0, or unity power factor, for 1-phase systems. Loads that cause ‘leading power factor’ can cause some issues. Overexcited synchronous motors (elevators) and capacitive loads can cause leading power factor, where current leads voltage. If not controlled these can lead to loss of voltage control and possible damage to the generator. Most generator sets now use digital automatic voltage regulators and excitation systems to produce stable voltage and to better handle ‘non-linear’ loads. At the same time, manufacturers of ‘non-linear’ load equipment have added filters to limit harmonic current distortion. Some facilities are also using capacitors to improve power factor when operating on the utility source to avoid higher energy charges. While these scenarios provide positive impacts on the system for the customer, they can cause serious problems for a generator. Filter equipment is usually sized for the maximum load of the UPS or motor load. At the light loads there may be excess filter capacitance, causing a leading power factor. Other loads need to be applied to try and offset this issue. If there aren’t any other loads in the system, the generator controller could trip out. Utility supply can absorb the reactive power output because it is so large in relation to the filter system and has many other loads that can consume this energy. 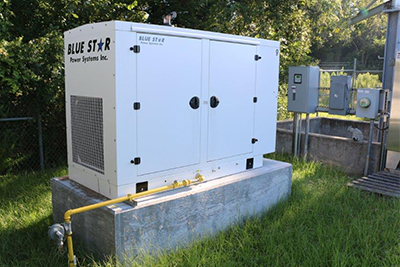 A generator cannot handle the rising voltage from the leading power factor. This rising voltage causes the voltage regulator (AVR) to turn down and reduce the alternator field strength. If the AVR turns all the way off it loses control of system voltage, which can result in large increase in system voltage resulting in damage to loads, as well as causing loads not to operate on the generator set. A UPS will automatically switch off of its regulator if it sees high voltage, other loads cannot. Solutions? Modify sequence of operation so loads that require reactive power are on the bus when the UPS ramps on to the generator. Put mechanical loads on first, then UPS. Or if the mechanical loads are too large, break into smaller groups of loads. Turn off the filters when operating on the generator set. There is no need for Power Factor capacitors on the emergency side as they are only needed on the utility source to avoid higher energy charges. We hope you found this information helpful and look forward to posting more helpful tips soon. Let us know what we can do, we’re here to help. Give us a call at 281-358-0980 or send us an email at info@kentechpower.com.